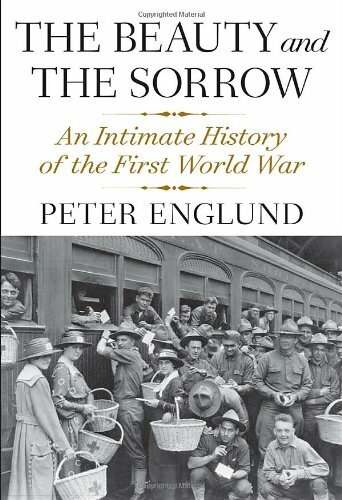 The Beauty and the Sorrow, an “intimate history of the First World War,” blends 20 accounts by those who fought, nursed, watched, waited, and were imprisoned. Peter Englund provides a narrative framework that avoids the usual summations of battles and fronts. A chronology for each year of the conflict precedes the excerpts from diaries, letters, and memoirs that enhance this military historian and war correspondent’s panoramic array of individual experiences. The Beauty and the Sorrow retells forgotten tales of an international and diverse set of participants, in combat or as civilians, at home or in the trenches. Olive King leaves Australia to drive a Serbian ambulance; Andrei Lobanov-Rostovsky goes home from the front to stumble into the Bolshevik uprising; Vincenzo D’Aquila sails from New York City to join Italy’s forces, only to be jeered at by native recruits unwilling to fight for a collapsing nation; Rafael de Nogales as a Venezuelan adventurer winds up on the Ottoman side witnessing the Armenian genocide. At first, many are eager to join; the initial enthusiasm fades as rapidly as hopes that the war would be over by Christmas 1914. Mr. Englund observes how the previous European conflict, between Prussia and France in 1870–1871, had been brief, and the difference between that clash and the Great War unfolds through his attention to Mesopotamian, East African, Italian Alps, Galician, and Russian conflicts. His focus beyond the Western Front may remind readers of why this war merited its new adjectives. A commander Gallipoli, who after the war takes the name of Kamal Atatürk, earns a cameo in one of many footnotes from Mr. Englund, adding insight. This Turkish leader told its 57th Regiment: “I am not ordering you to attack. I am ordering you to die.” His regiment was annihilated. Gaza falls, and de Nogales rides into its ruins. “On the blackened walls of buildings that were still smoking and tottering on the point of collapse could be seen large purple patches that resembled red carnations, carnations of blood marking where the wounded and dying had rested their chests of heads before drawing their last breath,” he recorded. Peter Graves translates this from Swedish seamlessly. Mr. Englund’s compilation slows in pace as the war drags on, its coverage can weary, his index needs more listings, but his details educate. Men depended on horses for supplies; their casualties soared. The cavalry’s replacement as a secret weapon had been rumored in advance as a “tank” carrying water. Skirts shortened as women’s fabrics thinned. Soldiers, to evade service, might rub gonorrheal pus from prostitutes on themselves. Cigarettes freed soldiers’ hands, while lessening the stench of corpses and excrement. Close-cut hair eased treatment of head injuries. The war’s first skirmish was in Australian waters against a German ship. Many who enlisted, faithful to the Continent’s monarchs, found themselves radicalized. If the Germans had known of widespread French mutinies late in the conflict, they might have achieved a breakthrough, but word never reached them across No Man’s Land. Early on, brutalization wears down all who write. At first, a kind of beauty might be glimpsed amidst sorrow. Sarah Macnaughtan learns to dress wounds a month into the war when many in Antwerp already await her care: “Some of them bury their heads in their pillows as shot partridges seek to bury theirs among autumn leaves,” she reports. Fourteen of the twenty people involved in these experiential accounts of WWI were in their twenties when the war broke out. Three will die, two will be wrecked, two will be captured, and two—one a Belgian flying ace—will become heroes. This history reminds us of the enduring, if sinister, truth of the above remark. One soldier, who had served as a runner of messages for what had been the Austrian forces, laments the defeat of his homeland. He learns in the hospital of his homeland’s defeat. The Beauty and the Sorrow ends with the soldier’s vow: “I decided to become a politician.” The soldier was Hitler.